I experienced some difficulties with redbird reloads at my local Target stores. The closest store from my home started not accepting credit cards and prepaid cards as payment for a redbird reload yesterday. And today, I went to the other store. They don’t accept prepaid cards, but still accept credit cards. It’s the store I go the most frequently because it is the closest from my home. Until yesterday, they accepted any type of payment methods for redbird reload. A reload is available at guest service only. I visited yesterday and tried to use a Visa gift card for reload. A clerk asked me to hand my ID and the cards and started asking other clerks if VGC can be used for a reload. There were three clerks at that time, and apparently a manager was absent. They discussed for a minute and ended up with opening a file (=a manual.) And then, it came to conclusion that acceptable payment types were cash or debit only, no prepaid cards. I could glance at a page of the file. There was a big letter saying “NO CREDIT.” It seems that they just started new policy on that day. I didn’t carry any debit cards. So, I had to leave the store without loading. Today, I went to the other store. This store also used to accept any types of payment for reload, but now they don’t accept prepaid cards. I went to Guest service and asked a clerk to add $500 to the card. Then, the clerk called a manager. Probably, only a manager or some clerks allow to do a reload in this store. (it wasn’t like that before, though.) I handed to the cards (redbird and VGC) and my ID. Then, she told me that the card has to have my name on it while she was touching on a surface of VGC. At least, I could use my credit card in this store. And I’m not sure if personalized Amex GCs are accepted. Amex GCs are very convenient when it comes to redbird reloads. That’s because they never get declined. You can always add a maximum amount, $1000, without worrying about a fraud alert. So, when I get a personalized Amex GC, I will go and find out if they still accept it. I have reloaded at many stores. Each store has a different policy about redbird reloads. Some stores allows only one reload per day. Probably, this prevents people who has multiple (family member’s or friend’s) redbirds from loading all at once. And some store had already had “Cash or Debit” policy since last December. (I got redbird last December.) As long as I can tell, the policy is not standardized. I believe that there still are many stores still accept VGCs. If all stores accept only cash or debit, I will close rebird and open Serve again. (even if stores accept prepaid cards.) I used to have Amex Serve. It was very comfortable to load the card at Walmart ATM, without having it done by clerks. I believe the rules of redbird reloads are changing at more stores and getting stricter in the future. As long as any of my local stores accept credit cards, I keep a redbird. I received my eBay order today. 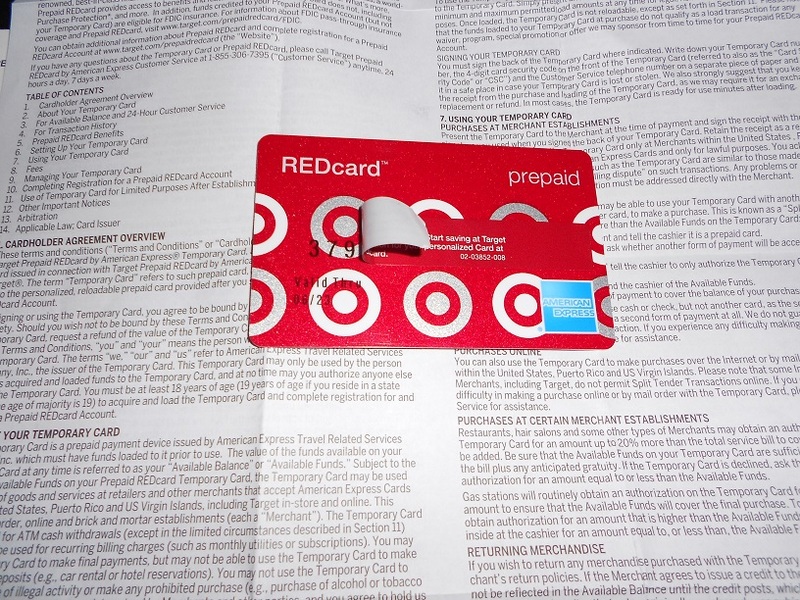 It is a temporary version of Target Prepaid REDcard (AKA Redbird.) In the package, there is a temp card and folded paper written of cardholder agreement. A card number and a security code of temp card are covered with tape. With the numbers, you can register for a permanent card. 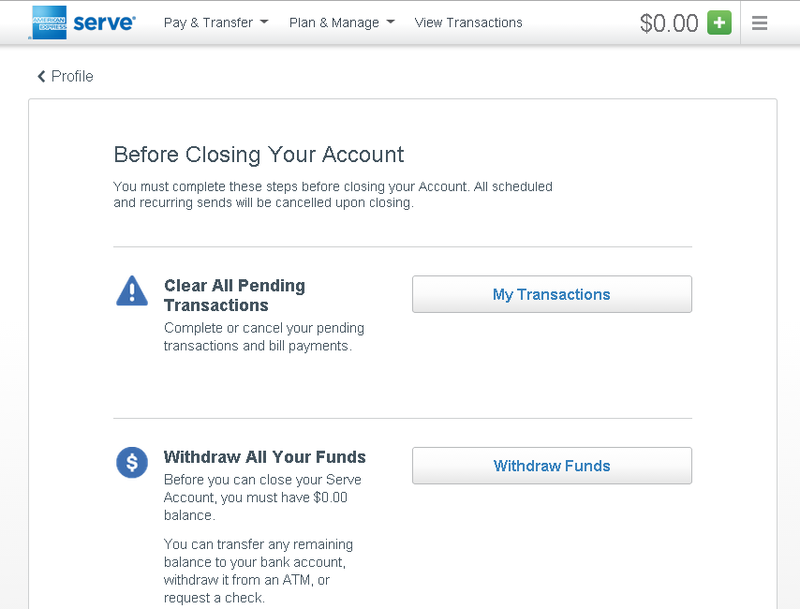 But first, I have to close Serve account because AmEx doesn’t allow to have both cards at the same time. Before closing the account, take advantage of Serve for the last time. Redbird can’t connect to Amex Offer. Redeem all offers you are interested while you have Serve. And, remember you have to make sure that statement credit is posted. Use another advantage of Serve, $200 x 5 online reloads with credit card. It will be the last online-reload with credit card, which is very easy and comfortable MS that AmEx officially allows. Reload online $1000 with debit card as well. I think I will be able to reload another $1000 to Redbird in the same month. So, it may be the total $2000 reload online with debit card only this month. When you close an account, you need to make the balance down to zero. It will be easily done by paying bills and withdrawing to bank account. But, remember it takes days for these transactions to complete. When I order a temp card on eBay, I had already done 0nline-reloads and Amex Offers, but there was one pending transaction that I canceled the order at Newegg.com. It took more than a week to be cleared. After it had been cleared, I withdrew the remaining balance to my bank account. Now, I am waiting for that transaction to complete. Check and double-check all of these. Close an account by clicking “Close Account” located at the all the way bottom in Profile page when everything is good. Otherwise, you can’t close. You will see this page. 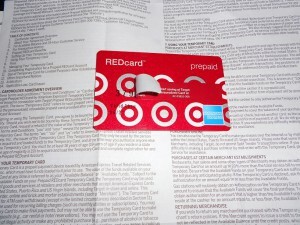 I have been waiting so long for Target Prepaid REDcard (AKA Redbird) to show up at Target stores in the state (NY) where I live. However, there have been no sign of it. I asked store clerks several times, but they don’t even know its existence. Since I don’t have family or friends in states where Redbird is available for purchase, I was just waiting, but I can’t wait anymore. I ordered a temporary card on eBay. I’ve read and re-read all posts related to Redbird in Frequentmiler’s blog. According to the posts, it doesn’t matter if the information of the purchaser and a person who register don’t match so you can ask someone to buy a temp card for you. When you active (buy) a temporary card, you give your name, address, BOD, and SSN to Target. They check your ID. So, name, address, and BOD are supposed to be real, but SSN isn’t. 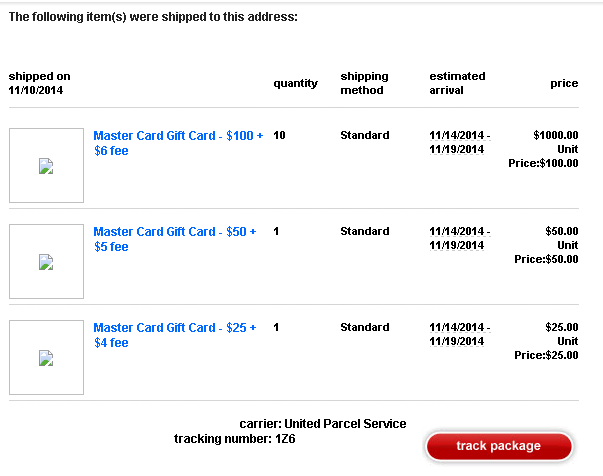 I guess all eBay sellers use made-up SSNs when they activate temporary cards. There are some different types of listings. Some sellers sell non-activated temp cards. The prices of non-activated cards are around $10 less than activated ones. 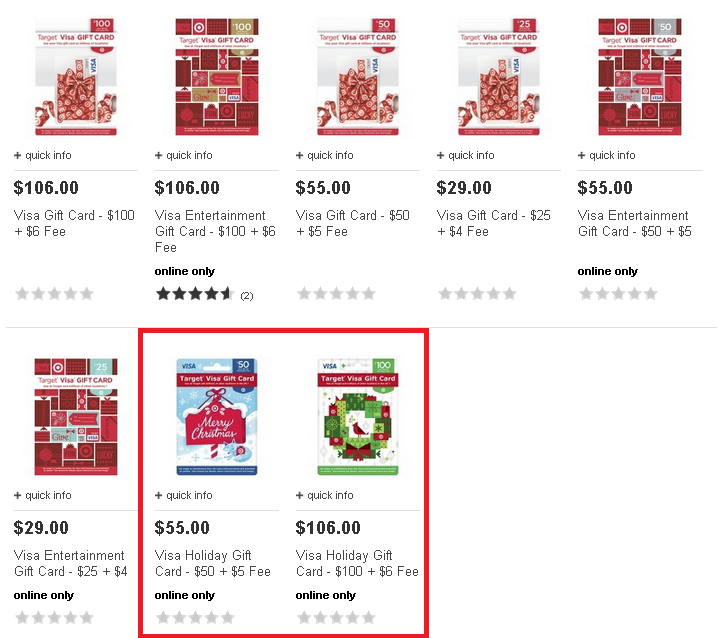 If you order these cards, you will need to activate at Target store for yourself. And reportedly, there are some cases where temp cards may not be activated in states where Redbird is not available. Besides, I wonder how they got those cards. I don’t think they got them in the right way. You’d better avoid dealing with them. And also, there are sellers who lists temp cards that have been activated and loaded only a penny! I just don’t want to deal with such people. The card I ordered is a temporary card that has been activated and loaded $1. The seller offers an option to send pictures of front and back of temp card via email so I could register online right after a check-out. I asked a physical card in the package to be sent by mail, though. One of the reasons for that is I have never seen the package other than ones in pictures. I just want to see it and touch it and open it. The other reason is that I can’t close Serve account right now. Recently, there are many good Amex Offers. I rushed to redeem all good offers, but statement credit from some offers hasn’t been posted yet. Even if I get information of temp card via email, I won’t be able to register right now. Both Serve and Redbird can reload in-store up to $5000 per month and online reload with debit cards up to $1000 per month. 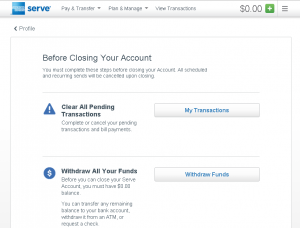 However, Serve has an advantage over Redbird by $1000 online reloads with credit card. And Serve can sync up with Amex Offers, but Redbird can’t. 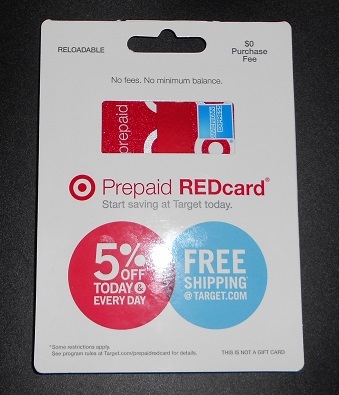 Conversely, the advantage of Redbird over Serve is you can receive instant 5% discount for purchases at Target. 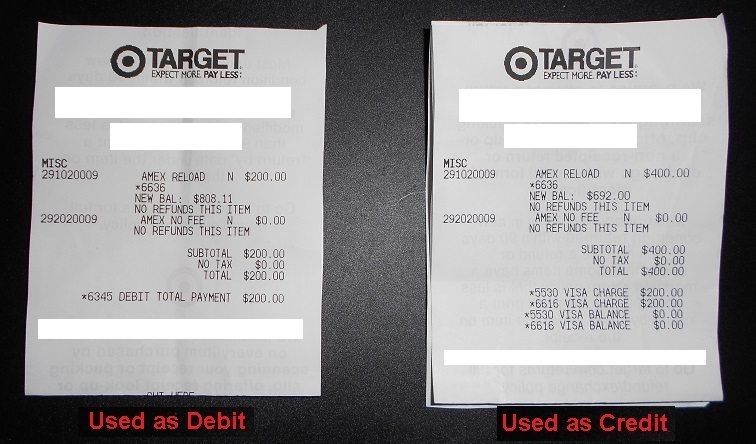 And Target currently allows any types of payment for in-store reloads. 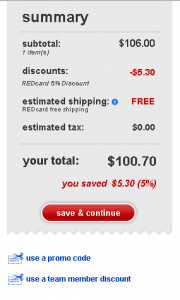 5%-discount alone isn’t great because I already have REDcard debit. But you can add money with reward credit cards and then use the card for 5% discount. That means you can get more than 5% discount for Target purchases. When I compare each advantage, Redbird is more beneficial to me than Serve. There are several Target stores in my neighborhood, and I shop there very often. As for Walmart, it is not far away but further than Target, and I buy something there only when I visit for reloading Serve. There is a couple of other reasons that I chose Redbird over Serve. I don’t buy less Visa GCs than I used to. The source of Visa GCs was mainly staples.com. I used Chase ink Cash credit card for those purchases to maximize the rewards. Chase ink Cash offers 5% cash back for purchases at office supply stores up to $25000 annually. It is unlikely for me to use that much for merchandises. So, I used to buy Visa GCs from time to time. However, I don’t need anymore since Staples started selling eBay GCs. eBay is a great place to buy discounted GCs. I spend a lot for discounted GCs on eBay. Here is another reason. 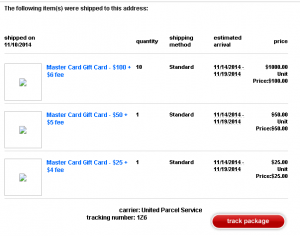 Before eBay GCs showed up at retail stores, I had been using AmEx GCs for eBay purchases. When I buy AmEx GC, I earn credit card reward and cashback from shopping portal. But AmEx GCs spending slowdown now because of eBay GCs. Redbird would recover the spending speed of AmEx GCs or rather boost up by reloading Redbird with AmEx GCs. There are two types of listing of Redbird on eBay. Non-activated: Sellers will send you an unopened package, which is exactly in the same condition hanged on GC racks in Target stores. You will need to take it to Target store and have it activated. As some sellers say in listing pages, you may have trouble activating it at the store where Redbird isn’t for sale. Activated & Loaded: Sellers purchased at their local Target stores and had them activated. Temp cards are loaded at least $0.01. Shipping options vary from one seller to another. Some sellers send the whole package to you, and some sellers send you photos of temp cards. There are also sellers who let you choose one between these two options. I went back to the shopping cart to remove the GC, but I found something very strange in the cart. Where is a $6 purchase fee? Will I get Visa GCs with $0 purchase fee? Is this a part of the promotion or just an error? I proceeded to checkout. The final page (one click away from completing an order) showed the same. The total was $100. 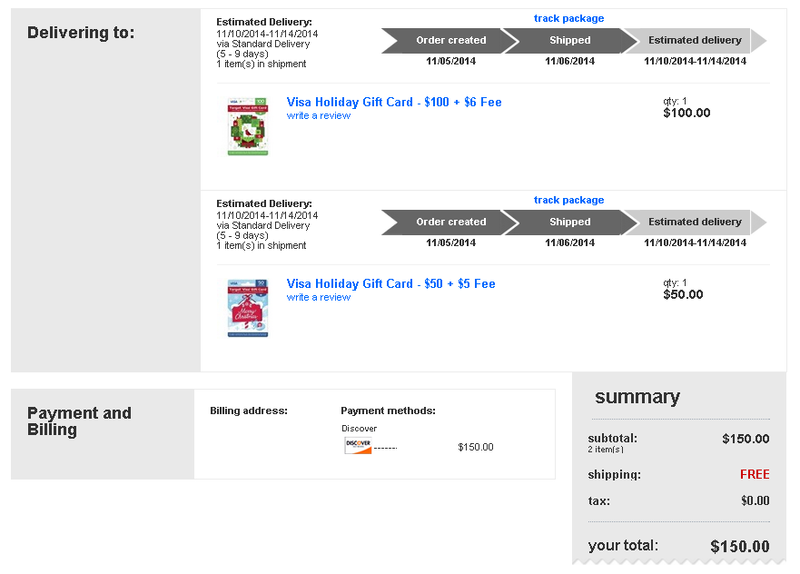 I added another one ($50 Holiday GC) and completed an order. It could be just an error. I thought Target would cancel the order. However, I received an email of the shipping confirmation. The cards are on the way! And I check the site tonight. 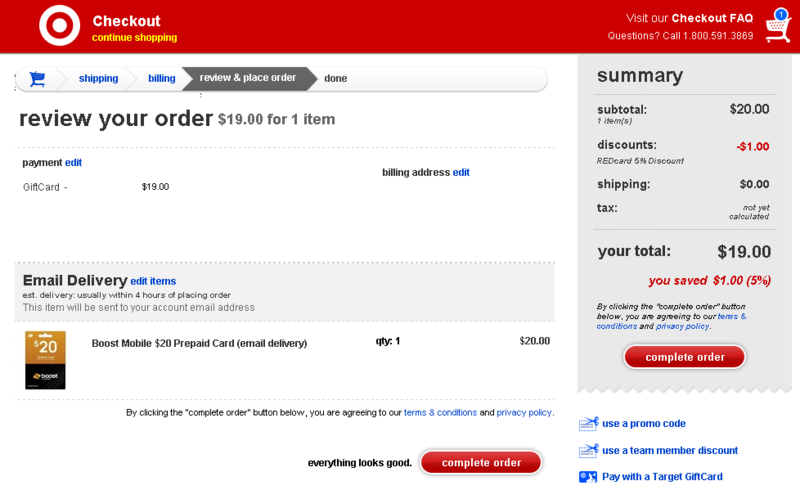 Target charges a purchase fee now. I don’t know whether it was a mistake or promotion, but I don’t care. I do care that I should have bought more GCs last night. GCs from Target can’t be use for Walmart swipe reload (to BlueBird/Serve). But Family Dollar accepts these GCs. And now I found that Reboost card (email delivery) was available online. I’d like to conduct an experiment for which I have longed. 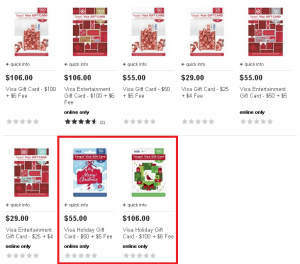 Target offers 5% REDcard discount almost all items including gift cards. Except for Visa or Target GCs, you can get 5% discount on the purchase of GCs. Online, create your account and enter your REDcard info and you will see 5% discount automatically applied when you add items to the cart. In billing section, when you choose other credit cards, 5% discount disappears. However, when you choose Target Giftcard or PayPal, 5% discount stays. Let’s continue with PayPal. 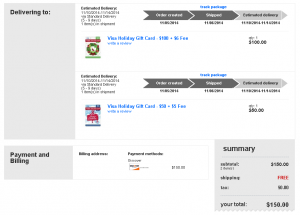 5% discount ($1 in this experiment) is described as “Promotion on Boost Mobile Prepa…” in PayPal website. But the discount disappeared when I returned to Target.com. Next, I tried to choose Target GCs. But, first I needed to clear up PayPal payment information by logging out and in again. 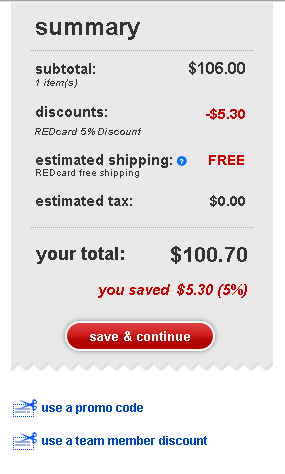 After adding an item to the cart, I also needed to choose REDcard and click “save&continue” to make 5% discount reappear. Then I chose Target GCs, and 5% discount stayed until the final page. I checked out and received Boost Mobile redemption code within an hour. Everything was fine. The amount deducted from Target GC had 5% discount. I successfully entered the code and added money to my Boost Mobile account. Target GC I used for this purchase, I bought it with about 7% discount. So, this transaction is about 12% off deals! 12%!?…. Wait a minute. It is not only 12%. It’s more because there was no tax. When I buy Reboost cards in stores, stores charge a sale tax. When I pay online directly with credit card, Boost Mobile charges a sale tax. So, there is extra 8.875% discount in this transaction. 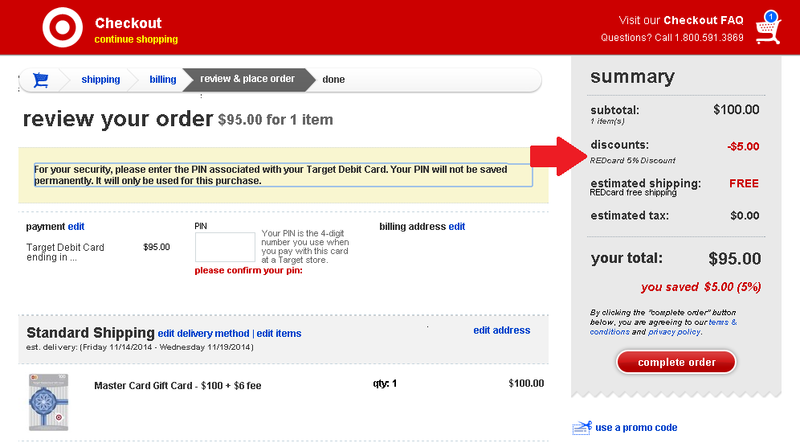 I tried to do the same thing on purchase of Target MasterCard GC, but it didn’t go through. 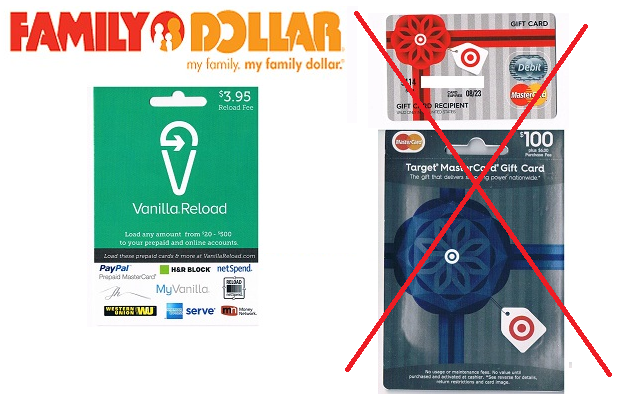 Target doesn’t allow to use GCs for the purchase of MasterCard GCs and Visa GCs. I could check out but received an email of cancelation minutes later. 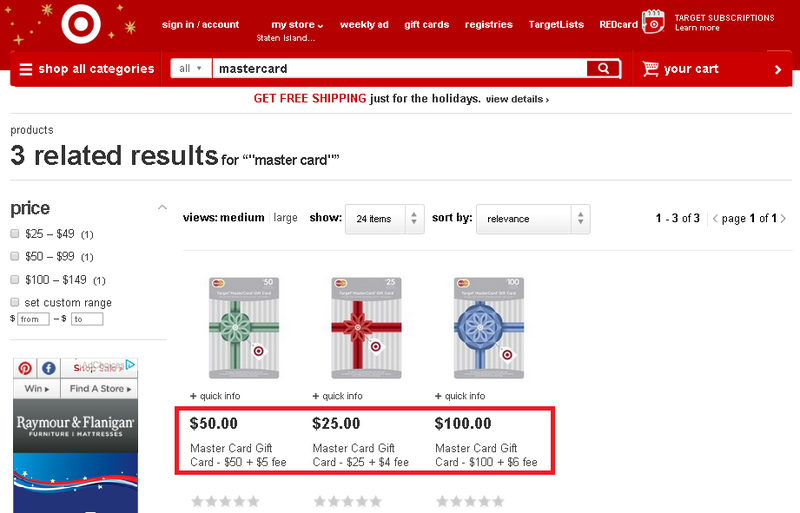 Since Target MasterCard GCs appeared online, Target still offers 5% REDcard discount on the purchase of Target MasterCard GCs. Purchase fee of $100 GC is $6, and the discount is $5.30. If there is a way to compensate the loss ($0.70), it will be a way of manufactured spending to consider. 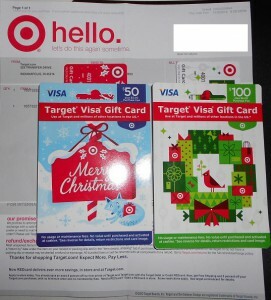 So far, I haven’t found a cash back portal that pays on the purchase of gift cards at Target.com.